A very hot summer like the one we are having can be disastrous on your hair. The sun’s rays are not only dangerous for your skin but can tear your hair to shreds. Combine this with other all the other elements we expose our hair to in summer time like chlorine, salt water and sunscreen amongst others, and your hair can really get fried. Below are my five tips on how to care for your hair this summer. 1. Prevention is better than the cure. How many times have we heard this, but it is true. Cover your hair where possible. Hat’s, scarf’s, bandanna’s, whatever your look is – use it. Like sunscreen for your skin, this is by far the best option. For the men like myself who has a receding hairline or thinning hair up top, pack on the sunscreen. Nothing worse than a sunburnt head. 2. Sunscreens for your hair. The key is using the right products to help protect your hair. 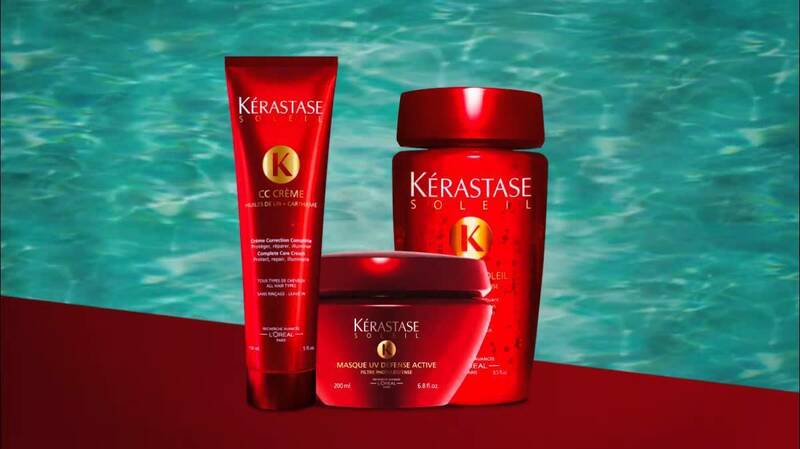 Kerastase has a great range of sun care products called Soleil. There is a shampoo to cleanse your hair after being in a pool or the surf, a masque that re-hydrates your hair after being exposed to the elements, a CC Crème to moisturise and act as a sunscreen and a product called Aqua-Seal. This product is amazing to help really protect your hair leaving a UV coating on your for maximum protection. Aqua-Seal has to be shampooed out of the hair after use. Keep reading to see our special offer on the Soleil range below. Using a good quality brush, it is recommended that you brush your hair on a regular basis. Your scalp produces natural oils and brushing your hair distributes the oils through to the mid-lengths and ends. This also hydrates your hair and can act as a protective barrier from the elements. Using styling tools can take its toll on your hair. Combine that with all that’s going on in summer, and you can potentially do serious damage to the condition of your hair. One of our favourite products at the moment to use before and after styling is Serum Therapiste by Kerastase. It is a dual action serum, which can be used on both wet and dry hair. It is designed to repair and seal any split ends and has up to 230°c heat protection against all your styling tools. It will instantly leave the hair with an amazingly smooth and shiny finish. Having your hair trimmed regularly is a must to keep your hair in shape and to stop it from splitting. We also have amazing in-salon treatments like Olaplex and Kerastase Rituals, which can really strengthen the condition and restore the integrity of your hair. We can also touch up your colour or tone any discolouration you might have had over the holidays. Your Hair by Phd stylist is the best person to talk to about any concerns you might have with your hair. If you would like to shop any of the Kerastase Soleil products click here to go to our online shop. Buy any two products and we will give you 20% off. Just use the code summer2019 to get your 20% off. In 2018, Hair by Phd celebrated it’s 50th birthday. This was only one of the many amazing achievements that happened this year. Hair by Phd continues to grow with our Camden and Carlingford salons welcoming some new team members into the salon’s family, while Parramatta also saw new team members joining this year. The Hair by Phd family is growing outside of the salon too! Selma from our Carlingford salon welcomed her first child, Layla, into the world earlier in the year and now we are happy to announce that Sarah and Hope from our Parramatta salon are expecting too. You could say there’s something in the water at Hair by Phd. Congratulations to all 3 of them. Also, a big congratulations to Bec, our Director at Carlingford, and Hope, from Parramatta, who both tied the knot during the year. In September, we had a visit from the Parramatta Lord Mayor, Andrew Wilson, to congratulate Peter and Georgette on 50-years of success. This is something not many people in business have achieved and for an individual who arrived in Australia with very little understanding of English, it is an amazing accomplishment. Peter’s mantra of treating every client who enters our doors with respect, lives on strongly today within all our salons. I believe it has been the key to the group’s success. You can read more about the 50-year story here. This year, our Camden salon turned one and continues to grow and make its mark on the community. Lead by our amazing stylist, Lemai, the team is growing and developing nicely. Camden is a great town and I really enjoy my weekly visits their working with the team. The team finished off the year at the beautiful Rockpool Bar and Grill for our Christmas party. This was a well-deserved night for all the girls for their contribution in making Hair by Phd what it is today. There were 21 beautifully dressed ladies and I at the dinner (Lucky me). Check out some of the images in this post as well as on all our social media platforms. As a lot of you are aware Briony, my wife, is the head coach of the NSW Swifts and I would like to welcome three girls from the squad as our Hair by Phd Ambassadors. Paige Hadley (Carlingford), Sophie Garbin (Parramatta) and Sophie Halpin (Camden). The girls will be in the salons on a regular basis, so keep an eye out for them. We will organise a meet and great with the girls during 2019. Also, in 2019, we have some exciting initiatives coming up. Stay tuned for our big Olaplex promotion we are holding in January. We will also introduce Seamless1 extensions to our range of services in the near future. We are running different salon hours across our three locations through the Christmas and New Year period, so please see below our Christmas Trading Hours. I hope 2018 has been wonderful for you, and may 2019 bring you all heath, happiness and good times. On behalf of Louise, Bec, Lemai and myself, we would like to wish you all a Happy Christmas. See you in 2019. Yep! It’s that time of the year again; Briony and I were watching a program last night on Christmas in England. It was about some celebrities and their take on an English Christmas. They are a funny lot the English I tell you. We had a good laugh and then Briony said that Christmas is a very stressful time of year. It does seem crazy that we all go nuts for this one day. For some it’s about the religious aspect, others about the presents and some just enjoy the parties. For me it’s catching up with family and friends and just taking time out, eating good food and sharing great wines. Whatever Christmas means to you, looking and feeling great about you is where Hair by Phd comes in. We have some great Christmas packages and gift ideas this Christmas. Whether it’s about spoiling yourself or spoiling someone you love a Hair by Phd Christmas package is a great way to go. Giving the gift of beautiful hair is what we do best. Check out the packages below or chat to your Hair by Phd stylist about what will work for you. I must say the giving part of Christmas is the one I love most. Let Hair by Phd take a little of the stress away this Christmas. *For this Christmas, we are offering an Add-on Package to any full price colour service. No senior’s discount applies to any of these packages. I have a story to share about a young migrant who came to Australia in 1960 from his home country of Lebanon. I have heard this story countless times in my life and as much as I have heard it before and rolled my eyes when my father starts again, it truly is a story I am very proud of. 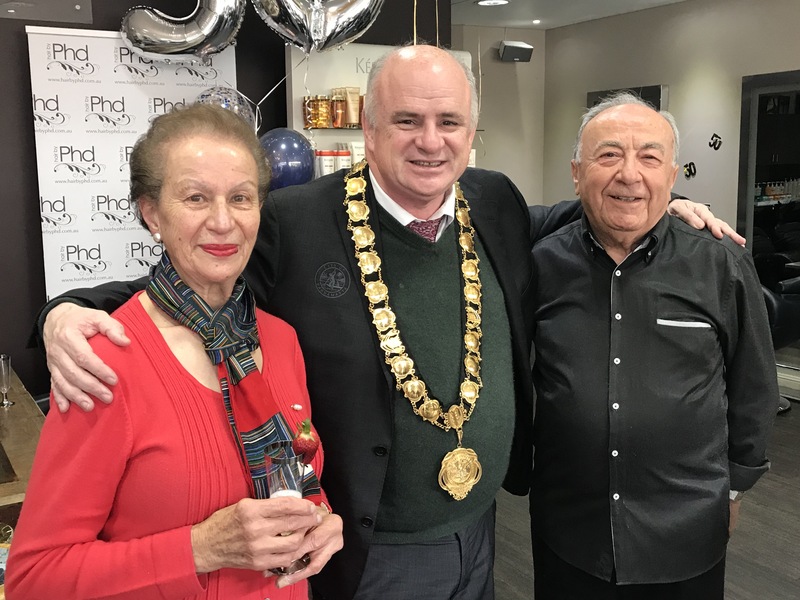 Read on to see how Hair by Phd started and how it has grown to be a family business that really has contributed to this great country of ours. I’m sure there are many success stories like this out there; unfortunately, I don’t think they get told enough, we tend to only focus on the bad ones. Peter was a 20-year-old young man in 1960 when he chose to come to Australia for a better life. His knowledge of the English language was not great; he borrowed the money to make the 3-week journey by sea. He chose Australia because his older brother had met an Australian soldier in Lebanon who had brought him to this beautiful country. Peter came from a family of eleven children, they were poor and life was tough. He was lucky enough to have an uncle who trained him to be a barber. Back in those days, you would have to pay someone to teach you the trade until you could start earning money for the business. His uncle did this for free. So Peter packed his bags and embarked on a three-week boat journey to join his brother in the land of opportunity. All he had was his bag, scissors, comb and a debt for his ticket over here. Not long after landing, Peter got a job working as a barber in Sydney’s CBD. He applied his trade and learnt to speak the language. He did this for around five years and through hard work and endless hours travelling around to friend’s places to cut their hair and play cards on the weekends, he paid his debt and saved enough money to open a small barbershop in Strathfield. It was now 1965 and this is where Peter’s Salon started. In 1968 he was forced to close Strathfield because the lease was up and on the 2 September 1968 he opened a salon in Phillip St, Parramatta. He had to borrow money from the bank for this one and as a token of his appreciation to the bank manager who lent him the money, he was the first client in Phillip St, and yes it was a freebie! (Building customer relations from day one). 1968 was a massive year for Peter, he got married to Georgette in January and they were expecting their first born in November. The salon soon grew to three team members and in 1970 Peter employed his first apprentice, Greg Bartley. 1970 was a special year for my parents, I was born and they haven’t looked back since LOL! Greg was with Peter for many years and has since gone on to be a very successful salon owner in his own right. He and I have become great friends and share a lot in common, including drinking too much red wine. The early 70’s became very tough for the barbering business, as fashions changed, inspired mainly by The Beatles. Men started growing their hair longer and getting their hair cut less often and this really hurt business for Peter. Trying to work out what to do next before he went broke was tough, so he decided to employ a ladies hairdresser. This made Peter’s Salon, Peter’s Unisex Salon – one of the first unisex salons in Parramatta. By the late 70’s, early 80’s, Peter had 3 salons – Parramatta, Bankstown and Wentworthville. Peter had created all this from hard work, the help of great people and an awesome wife. Georgette, although not actually working in the salons, was at home bringing up four children on her own, as well as being a major support for Peter. 1986 Peter’s Hair Designers is double the size and ready for business. Don’t you love the 80’s. Peter’s Hair Designers in the late 80’s. I joined the team fulltime in 1985 and in 1986 we doubled the size of the Parramatta salon and business was booming. Peter’s Unisex Salons changed its name to Peter’s Hair Designer’s and the new era started. 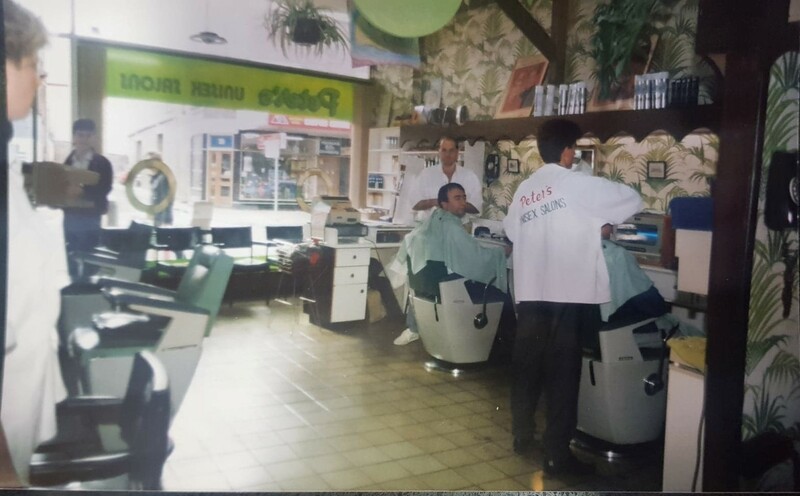 My first venture into salon ownership was in 1990 when Peter and I opened Peter’s Hair Designer’s in Hurstville. I ran that for seven years and 1997 I decided it was time to spread my wings, closed the salon and went overseas for a few months. Upon my return in 1998, Louise my sister had started her apprenticeship and was making a mark in the industry. A truly talented hairdresser, the salon grew to new heights. In the early 2000’s we refitted the Parramatta salon and changed the name to what it’s known as today – Hair by Phd. Currently, we have 3 salons – Parramatta, who I partner with my sister Louise, Carlingford and Camden, who I partner with Bec and Lemai respectively. Both Bec and Lemai worked at our Parramatta salon for many years. I am taking the approach of growing Hair by Phd with our people and so far this approach is working well. People are what our business is all about, the love for the industry, our team and our clients. This is a lesson I learned early on from Peter – he would refer to his clients as friends and his team like family. He has trained hundreds of stylists through the apprenticeship program and many of them have gone on to be great hairdressers and salon owners. He has left a lasting legacy and contributed to this country by employing people and teaching them life skills, making people look great and making them feel good about themselves, and of course, lending a shoulder to lean on or an ear to listen to through good times and bad. There have been many ups and many downs along the way but to achieve 50 years in the one industry is an enormous feat. I have learnt a lot from my father and we all continue to be inspired by what he has achieved. We will not stop here, I look forward together with a new generation of great stylists to keep contributing to our communities and making sure dad’s legacy lives on. Introducing our beautiful bride, Shadi! Shadi was truly a classic beauty on her wedding day! Hair by Phd Bridal were thrilled to be apart of Shadi’s big day and create these stunning looks for her and her bridal party. Shadi was an existing client of Hair by Phd Carlingford and has been having her stunning balayage done by Selma (who is returning from Maternity Leave really soon!). We were of course thrilled to work with her on one of the most important days of her life. Thanks to her stunning colour and naturally thick and luscious hair, Shadi decided on a simple, soft and natural curl to compliment her highly detailed dress. Selma achieved this look by using a ceramic curling iron and setting her curls in clips, by doing so Selma was able to ensure her curls would last all day and into the evening. Shadi chose a strapless, highly detailed dress with both lace and beadwork. Because of the detail in the dress, this meant that simple hair was the order of the day. Selma created a beautifully simple style that complimented the total look and it was very important that the hair lasted the whole day and night. By setting the hair correctly Selma was able to achieve this so the hair remained bouncy and fresh as when it was first done. Our Bride had 7 beautiful bridesmaids for which Sarah created a soft and textured ponytail with delicate pieces around their faces. Perfectly suited to accompany the bride’s style as well as each of the bridesmaids. 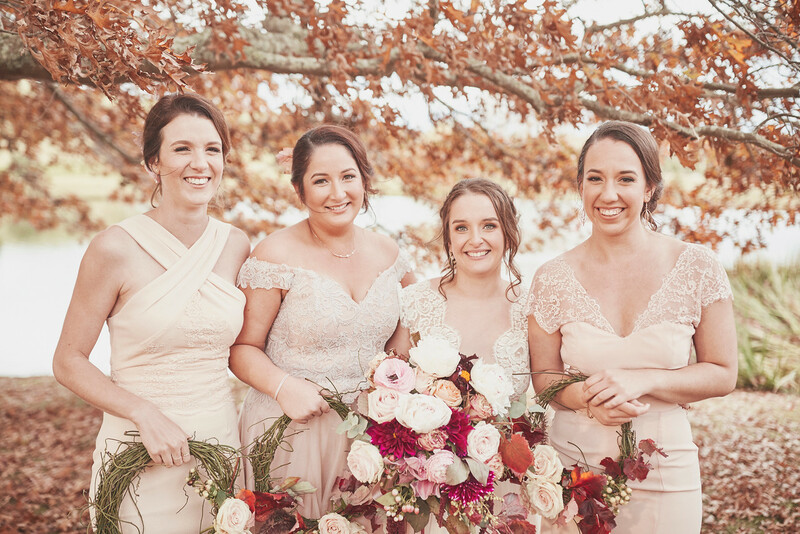 With beautifully coordinated dresses on each of the bridesmaids and similar hair lengths, creating absolutely matching styles for these ladies was the obvious choice and in a group of 7 truly creates stunning repetition. 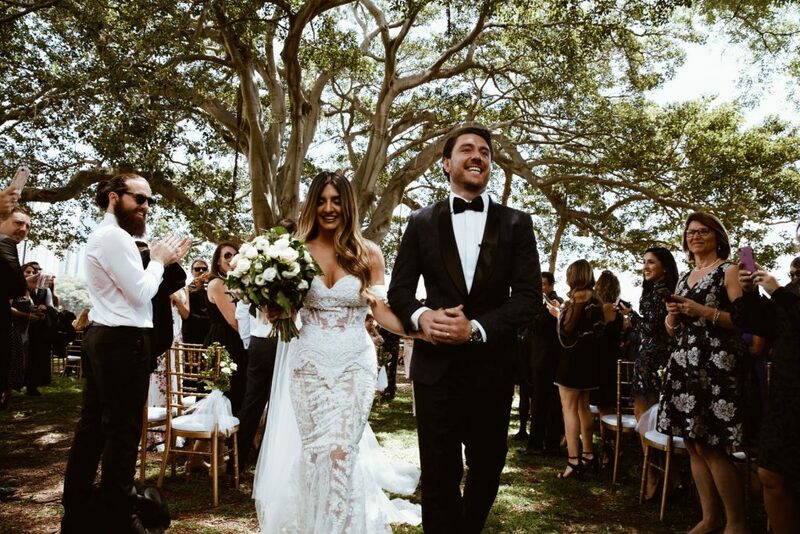 Huge congratulations to Shadi and her husband Alexander on their beautiful wedding and thank you so much for allowing the Hair by Phd Bridal team to help you achieve your dream wedding. If you or someone you know is getting married and are looking for the perfect team to handle your hair on the day, trust the team from Hair by Phd Bridal. We love hair and we love weddings and we want to make sure that both are perfect for you on your special day. Get in touch with us via our website at www.hairbyphd.com.au/bridal and let’s make some lovely hair. The team from Hair by Phd Bridal worked with our Real Bride Katie to create a truly stunning style for her beautiful wedding in Camden. We love being able to share and showcase a range of different bridal looks from our team at Hair by Phd Bridal and this soft updo is the true definition of a modern classic. Katie’s dress was a dramatic masterpiece with long train, lace detailing and a double layered veil. That meant that there were some serious considerations to include for our Hair by Phd Bridal team in ensuring that we created the right upstyle to anchor the veil and allow the beautiful structure of the dress to shine. We created a beautiful loose bun at the back of Katie’s head, which allowed us to effectively hide the anchoring point for the veil and left her neck and shoulders free to really highlight the neckline of the dress and her stunning decollete. Some loosely curled locks were left around her face to give some softness and movement to the look. Hair by Phd Bridal also created stunning upstyles for Katie’s three bridesmaids that were similar to her style, but distinctly different. The same soft bun as showcased on the bride was pulled around to the right hand side to give an asymmetrical look to the hair. The heavy hair on the right was balanced by a large braid on the left hand side and loose locks on the right hand side of their faces. With the addition of some small roses in the bun, these ladies looked every inch the beautiful bridesmaids. With similar-but-not-the-same dresses continuing to be all the rage in weddings, its important to note that iif you’re going this route it’s a good idea to have similar hair styles for your bridesmaids. With the dresses being quite different, similar hairstyles adds a sense of cohesion to the bridal party. With these girls, they each had a different style top half of their dresses, and having the same hair meant that they still all looked like they were part of the same party. Katie was an incredible bride on her wedding day and we were thrilled to help her achieve her dream hair for her wedding day. Wishing Katie and Shannon all the best for their marriage and future, and thank you for letting us be part of your special day. The team from Hair by Phd Bridal have been creating stunning bridal hair for years, which means that no matter what your favourite trend is or what your look is for your wedding day, we can help you achieve it. 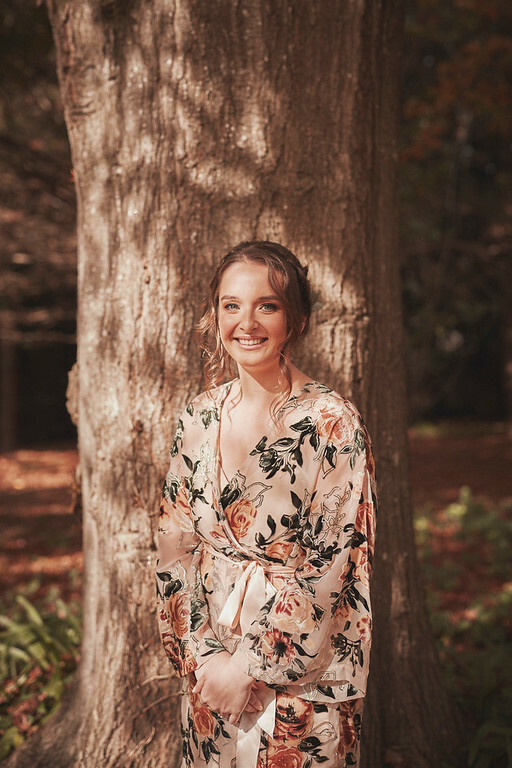 We have experience in a range of hair styles, from modern classics to truly natural brides and more sculptural looks – we can create exactly the hair you want on your wedding day. From colour consultations and management plans in the lead up to your day, to advice on products to condition and care for your hair, the team at Hair by Phd Bridal are at your service in the lead up to your wedding. 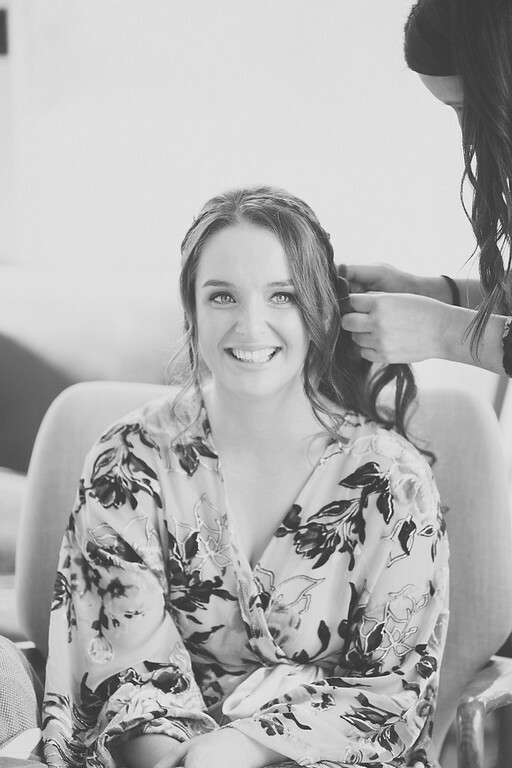 If you would love to a team of wedding hair experts in Parramatta, Carlingford, Camden and everywhere in between, we would love to work with you! Get in touch via the Hair by Phd Bridal page and one of our stylists will be in touch. French Styling Photoshoot by Hair by Phd + Oh It’s Perfect! The team from Hair by Phd were invited to collaborate on a stunning French-Inspired photoshoot recently, working with some of the best in the business in Sydney. The photoshoot touches on a French revival style that is totally on trend as the seasons shift. From fashion to food to beautiful hair, we are all being inspired to be a little more French in our day to day lives. Oui Oui! Paritcularly on the hair side, we are seeing a rise in requests for big, beautiful bangs as this trend circles round again to be back in fashion. Soft curls like these are infinitely wearable, from the office to a night out. Beautiful highlights and balayage colour keep the hair looking lush even with a simple style like this. The ponytail is getting a makeover to be anything but basic. Big and full, styled with strong bangs and add a touch of personality with a ribbon, a la Parisian style. We are seeing a rise in center parts again as bangs become popular and we move away from the side part that has dominated hair for the past decade. A few face framing pieces soften the look and refresh it. Keep your accessories unique and interesting to compliment this French style. Simple hair and classic fashions often need a lift, and accessories are the quickest way to do that. If you’re looking for a French Makeover in your hair, whether its in your cut, colour or style, the team from Hair by Phd would love to help you live out your Parisian dream! Speak to any of our stylists in salon today to refresh your look and give you that effortless glamour that is so typical of French women. Book your appointment online at www.hairbyphd.com.au and we look forward to welcoming you into our salons. I read in a newspaper article the other day that a certain Australian business was not allowing their staff to use the term Mum and Dad. Why? I hear you ask, I think it might have something to do with political correctness. “What a load of crap” I say. I find this very offensive, and would like to know how being a mum or dad can be offensive. As a dad I think it is one of the most amazing gifts I have ever been given. As for mums, well, my experience with mums is one of absolute delight. The mums in our lives make us all better people. How can one take offence to this institution just does not make sense to me. The relationship I have with my mother has given me an understanding of how to parent my children. It is totally unconditional. The relationship my children have with their mum and their grandmother’s is the making of them. To see the unconditional love that Briony has with our children is the most beautiful thing I have ever experienced. Briony as well as being an amazing mother to our four boys has had some great achievements in the past twelve months. She has been appointed the Head Coach of the NSW Swifts netball team. The Swifts are the team she played for 14 years ago. She is very excited about this new challenge and has inherited a great bunch of girls to coach. Her experience as a mum I believe is helping her manage the demands of the team from an emotional sense as well as from a technical or netball point of view. Working with a team myself who are predominately female has its challenges emotionally, however it has many rewards as well. Mentoring a team is a great responsibility and is a great way to really influence people’s lives in a great way. This skill of nurturing is one that comes from being a mum and being loved by a mum. I am truly blessed to have a great relationship with the mums in my life including my mother in-law. She will find that line amusing. I also understand that many people have not or have lost their mum. I can’t imagine what that would be like. It is hard for me to comprehend how we can ban people from using the term Mum and Dad, and I think this Mother’s Day we should be loud and proud of celebrating all MUMS! Hair by Phd will be celebrating Mother’s Day with the gift of beautiful hair. The bubbles will be flowing in all three locations to celebrate our mums the week leading up to Mother’s Day. Spoil mum with a Hair by Phd Gift voucher this Mother’s Day and we will give you up to a $100 gift voucher for FREE. Here’s how it works. *This offer is only available for purchase until the 13th of May. Free vouchers expire on 6 July 2018. Not available to use with any other offer and can only be used on full priced hair services. One free voucher per person. Be quick there are only 27 vouchers on offer per salon! Spoil mum or just spoil yourself with this great offer. Call or email now to get yours! How do I maintain my Hair Colour after leaving the salon? Having your hair coloured in the salon is in most cases a great experience. Walking out with a great new look, feeling like you are ready to take on the world. As hairdressers, we love making our clients feel like this. After investing the time and money into your beautiful hair, you want to make sure you look after your investment over the next few weeks. In this post, I will go over some suggestions on how to do this successfully. Whether you have had just had your hair highlighted or have had an amazing new colour put through, you want this to last. The best way to maintain your colour is through a structured regime with quality products. The first thing to consider is the condition of your hair. Simply put, the better the condition of your hair the longer your hair colour will last. The best way to make sure your hair is in the optimum condition is through in-salon treatments. You would have read my posts on the Olaplex treatment in the past and this product has really revolutionised the in-salon treatment. The ability for this treatment to repair pretty much any damaged hair is amazing. Olaplex can be used as a treatment prior, during and after your colour service. I would also recommend a visit to your stylist in between colour services for a stand-alone Olaplex treatment, especially if you have your hair highlighted. With all our Olaplex services you will receive a take-home Olaplex No 3 treatment valued at $49.95. We also have a great range of Kerastase and Schwarzkopf treatments, which are personalised for your hair type. This is a great way to leave your hair looking and feeling amazing and to have that post-salon feeling all the time. When it comes to using home hair-care products, your stylist is the best person to speak to. Choosing the correct product for your hair type is essential to get the best results. Below is a list of products that can help you maintain the best tone in your colour. This is an easy-to-use colour mousse, which not only tones your hair but also leaves it feeling moisturised. It has built-in conditioning agents that allow you to use it once a week as a colour refresher, toner and treatment. Schwarzkopf Igora Expert Mousse comes in a range of shades for toning and colour refreshing so that your home hair-care is suited specifically to your colour and style. This is a sulphate-free silver shampoo that is very gentle on the hair and with regular use keeps your highlighted hair looking true to tone. With all the elements our hair is exposed to, like the sun, chlorinated water and other hair products, your hair can change tone very easily. Using Schwarzkopf BC Silver Shampoo keeps highlighted hair looking fantastic and keeps those pesky yellow or brassy tones from coming back into your beautiful blonde. It is also great for naturally white or light hair that can have a tendency to throw that unwanted yellow tone. The Schwarzkopf Blonde Me Range is formulated purely for blondes. It includes a comprehensive range of products that care for your blonde hair at home, including a shampoo, conditioner, leave-in moisturiser spray and treatment, all with cool or warm tonal additives in them. Bonus, the entire range is sulphate free, which is good for your health and good for your hair. If you have highlighted hair or are naturally blonde, this is range is a must for you. The Kerastase Chromatique Range is specifically for coloured hair. The formulation protects the hair from the sun with its UV protectant and other external elements like copper, calcium and chlorine that are found in our water. It leaves coloured hair with amazing shine and really protects the hair from colour fade. The Kerastase Reflection Chomatique Range includes products to suit both thick and thin hair also with colour additives to keep your colour looking fresh and bright, with that salon-fresh tone we know you love. With any of the products or product ranges mentioned above, please make sure you consult your expertly trained stylist at Hair by Phd when choosing which to purchase. It is very important that we prescribe the right product for you and your hair specifically, so you can continue to have amazing hair after leaving the salon. Watch out for our Hair by Phd online shop coming soon! Hair by Phd Bridal were thrilled to help the beautiful Latara and her bridesmaids in creating stunning hair on her wedding day. 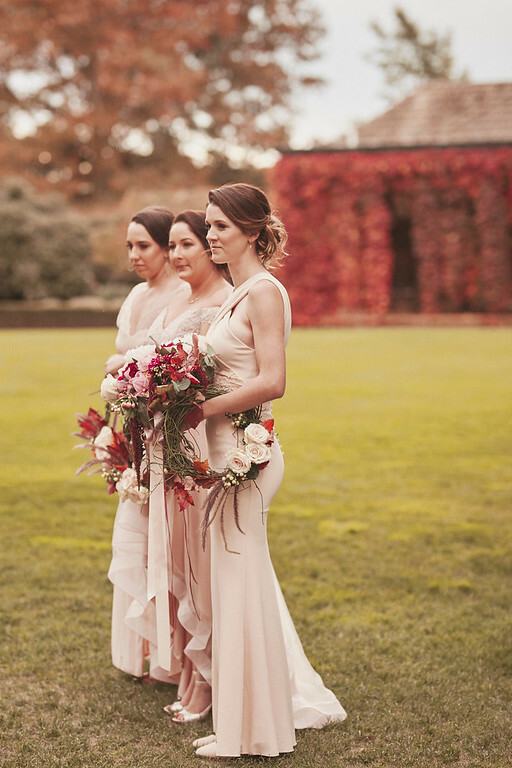 This beautiful wedding was held at the gorgeous Bendooley Estate in the Southern Highlands, and so Lemai, Director at our Camden Salon, went along to lead hair for the day. For the bride, we created a stunning updo with braids wrapping around the head to meet at the back of the head and finished with a beautiful floral arrangement. Soft curls framed Latara’s face, giving movement to the look and a soft, relaxed look that perfectly matched her vision for her dream wedding. For the bridesmaids, soft curls were turned into low textured buns, with the hair pulled off the faces of these beautiful girls. The buns were then surmounted with a single, simple flower to finish the look and tie into their beautiful and unique bouquets. When choosing the style of hair you want for your wedding, it is always important to consider both the style of event, your personal preference and what is going to work for the length of the event. By going with soft curls and relaxed braids, Latara continued to look stunning well into the evening without having to touch up hair or adjust anything during the day, which is often unachievable in the flurry of wedding activities. Choose a hair style that you feel comfortable in and that you can relax and enjoy in to ensure that you have a wonderful day for your wedding. The Hair by Phd Bridal team have lots of experience in creating stunning hair for brides and their bride-tribe and are always able to advise about the best way you achieve your dream look that will be both practical and beautiful throughout your day. The team at Hair by Phd Bridal are experts in all facets of wedding hair, from colour management in the lead up to the wedding to styles that suit you perfectly and will stay wonderful throughout your day. Trust our team to help you realise your dream hair on the day and get in touch with the Hair by Phd bridal team today.